Samsung’s foldable smartphone has been shrouded in mystery for a long time. The Korean company has been working on a foldable phone for years, and recent comments by Samsung executives suggest the device is just around the corner. The rumor mill has been referring to it as Galaxy X, but supply chain leaks suggest it would be called Galaxy F. After having faced numerous delays, the Galaxy F launch is expected to happen later this year. In a surprise but strategic move, Samsung might be planning to sell its foldable displays to rivals such as Oppo and Xiaomi even before the Galaxy F launch. Samsung is not the only company working on foldable smartphones. Huawei, Motorola, Oppo, Xiaomi, and many other vendors are preparing to launch their own foldable phones. Huawei or Samsung could be the world’s first vendor to introduce foldable handsets. Huawei has indicated it would unveil its foldable phone by the end of this year. In an interview with CNBC, Samsung’s mobile business head DJ Koh dropped the hint that the Galaxy F launch could take place in November. On the one hand Samsung is preparing for the Galaxy X launch in November. On the other hand, it’s in talks with its Chinese competitors such as Oppo and Xiaomi to sell its foldable displays to them. Sources familiar with the matter told Korean site ETNews that if Samsung concludes the deals with its Chinese rivals, the Galaxy F won’t be the only foldable smartphone on the market for long. Both Xiaomi and Oppo are known for bringing new technologies to the market pretty quickly. It could hurt the Galaxy X sales in the near- as well as long-term. So, why would Samsung want to sell its coveted displays to competitors? It’s no secret that Samsung is the world’s largest supplier of OLED panels for smartphones. It even supplies and makes money from OLED screens used in the flagship iPhone X. But with OLED screens, Samsung developed them, used them in its own products for some time, and started selling them to rivals only after a long waiting period. The Korean company might be making the foldable screens available to rivals right from the beginning to create a dependent market. Samsung is the company that created the phablet market. If Samsung creates a foldable smartphone market dependent on its own foldable display technology, it will not only make money on its own devices but also on devices made by its competitors. It will establish Samsung as the leading provider of foldable screens for smartphone OEMs. DJ Koh did not confirm whether Samsung’s foldable phone would be called the Galaxy F or Galaxy X. But he emphasized that the company had come up with capabilities, applications, and features that would set it apart from tablets. Past rumors have suggested that the Galaxy F would have a screen size measuring more than 7 inches when unfolded, offering a tablet-like experience. Koh said the experience on the foldable phone would be different from regular tablets. Koh said customers would be able to use the phone without unfolding it for “most of the uses.” But you’ll have to unfold it when you want to browse or watch videos. Without elaborating, he assured customers that the unfolded experience would be a lot different than the tablets. The company wants customers to think, “Wow, this is the reason Samsung made it,” said Koh. 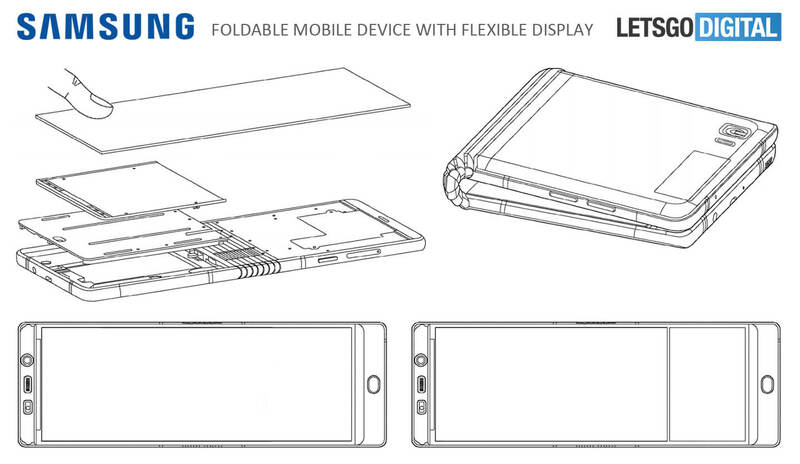 Patents filed by Samsung indicate that the Galaxy F display would fold like a wallet. The two halves of the screen will face each other when folded. They would measure 7 inches when unfolded. The device would also have a third display on the outside to give you quick access to notifications, time, battery percentage, cellular network strength, and more. The external display would eliminate the need to unfold the device even for the smallest tasks. The Galaxy F could pack a flexible battery developed by Samsung SDI to power the giant screen all day. It could also feature a self-healing material developed by Samsung that will remove scratches and fingerprint smudges. The company said in a patent filing that the self-healing material has excellent flexibility, making it suitable for foldable smartphones such as the Galaxy F. The self-healing material will also eliminate the need for screen protectors. According to the Wall Street Journal, the Galaxy F would be ridiculously expensive due to the high production cost of foldable screens. Sources told the WSJ that it could cost upward of $1,500. Such a high price tag could alienate the mainstream buyers. So, the Korean company would target niche audiences such as mobile gamers with the Galaxy F. Golden Bridge Investment analyst Kim Jang-yeol predicts the foldable phone would cost more than two million won ($1850) in South Korea. The Galaxy F launch is only a couple of months away. We expect to come across more details as we move closer to the launch event.